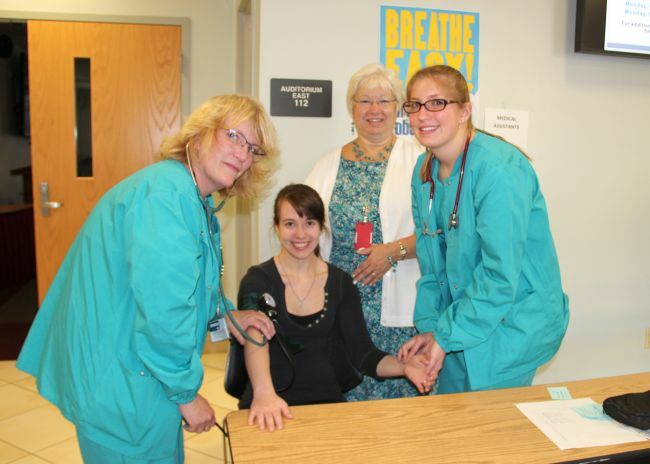 Medical Assistants Recognition Week is being celebrated at West Virginia Northern Community College by students taking free blood pressure readings. The week of Oct. 20-24 has been designated by the American Association of Medical Assistants so that the work of medical assistants throughout the country will be noted during this special week, with Medical Assistants Recognition Day set for Oct. 22. “The students are helping the community by taking free blood pressure readings,” according to Michele Watson, director of the Medical Assistant program at WVNCC. She explained the readings were taken Oct. 6 in the lobby of the Wheeling campus B&O Building and will be taken there again the week of Oct. 27. She explained that medical assisting is an allied health profession whose practitioners function as members of the health care delivery team and perform administrative and clinical procedures. With their unique versatility, she added, medical assistants are proving to be the allied health professional of choice for this decade and beyond. In fact, she said, according to the U.S. Bureau of Labor Statistics, medical assisting continues to be projected as one of the fastest growing occupations. The AAMA is the premier organization serving the professional interests and educational needs of medical assistants. It provides numerous services that help medical assistants put their careers on a successful and rewarding track and keep them there, Watson said.